If you've been following along with our blog, you likely know that KaiNexus is a company that provides continuous improvement software to organizations that are interested in spreading continuous improvement throughout their organizations. You might be surprised to hear, then, that we'd be the first to admit that technology is not a silver bullet that creates an instantaneous culture of continuous improvement. Accountable: Leaders must be accountable for promoting the spread of continuous improvement through their words and actions, every day, at every level. Committed: Leaders at all levels must be committed to daily continuous improvement, and communicate that commitment regularly. Lead by example: Leaders must not just talk about continuous improvement, but rather, they must practice continuous improvement in their own daily work to set the example for their staff. Disciplined: The improvement methodology must be practiced regularly and frequently, rather than in fits and bursts. We're talking about continuous improvement, not sporadic or episodic improvement. Consistent: The improvement methodology must be consistent throughout the organization, with every area practicing it in a relatively similar way. Visibility: The enabling technology must provide all leaders and staff with visibility into the improvement process, impact, and engagement at all levels of the organization. Collaboration: The enabling technology must support collaboration between all work areas, job functions, and shifts with improved communication, active notifications, and remote coaching. Standardization: The enabling technology must establish a common language of continuous improvement across the organization for a more disciplined approach and improved communication and accurate reporting. Impact: The enabling technology must capture the individual and aggregate impact of improvements in an accurate, consistent manner. KaiNexus' continuous improvement software enables the spread of continuous improvement with a variety of features that address the four requirements of a technology solution. Our software promotes the successful adoption and sustainability of the leadership and methodology components, as well. Often, though, we encounter organizations that are struggling with those leadership and methodology components within a successful culture of continuous improvement. We know that while technology is an important part of a culture of continuous improvement, it is only successful in spreading that culture when the leadership and methodology components are also in place. That's why we offer on-site cultural development services in addition to software packages. If you've tried to initiate a culture of continuous improvement but just can't seem to get the engagement you need, you might want to consider hosting a KaiNexus Kickoff. During a Kickoff, one of our expert facilitators will teach managers and staff the basics of Kaizen, focusing on the leadership behaviors and methodology requirements for creating a successful culture of continuous improvement. Better than just teaching, our expert KaiNexus Consultant will coach them as they learn by doing - soliciting real opportunities for improvement, entering them into KaiNexus, and working them as a team. Learn more about KaiNexus Kickoffs. If you're struggling to get staff and leaders excited about continuous improvement, or are struggling to show the potential for a large impact of continuous improvement, you might want to consider hosting a KaiNexus WorkOut. The KaiNexus WorkOut is a proven 90-day model that brings a broader team together, under the coaching of an experienced KaiNexus Consultant, to generate and implement improvement ideas that create an immediate, measureable impact under a theme, such as cost reduction or patient safety. A key component of this experience is remote coaching that helps leaders hone the skills they need to guide a successful continuous improvement culture and methodology. Learn more about KaiNexus WorkOuts. 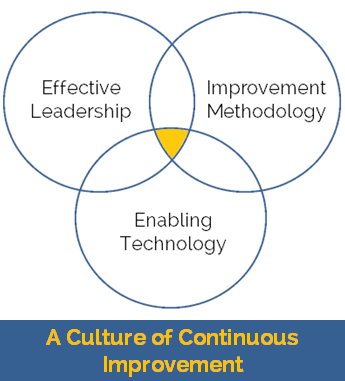 Interested in finding out how KaiNexus can help you develop your culture of continuous improvement? Contact us to learn more!